One of the biggest barriers to entry in any game is the preparation. I've created Unit Cards detailing costs, energy, stats, equipment etc that can be printed double-sided, 9-to-a-page. That means getting your games started quicker and less looking through books while you're playing. 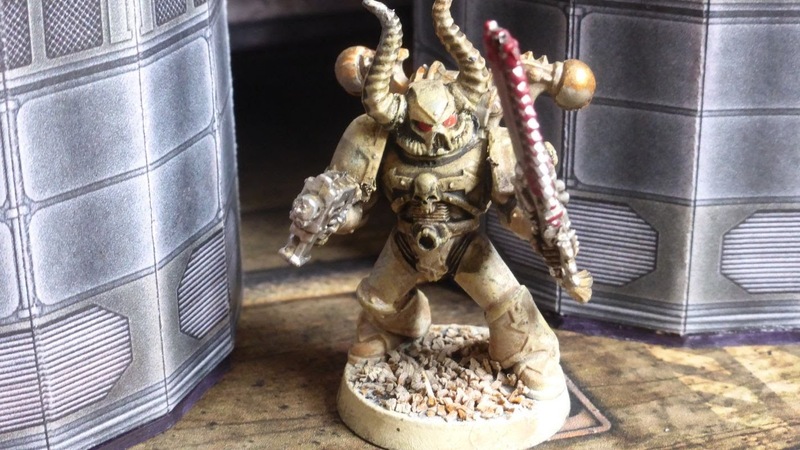 Grim darkness without Space Marines is like... Star Trek? Yeah, a pretty pathetic answer but I'll dwell on it some. 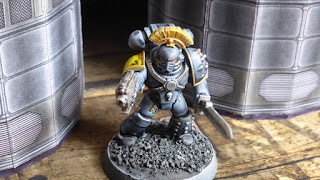 I've got me some Marines (both good guys and Chaos) and it's only appropriate that I stat them up - we've certainly used them in more than a few games. 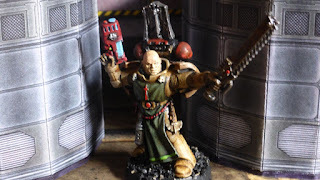 It's worth covering off a couple of Rogue Planet mechanisms which make for some interesting unit building choices, especially when tackling something of a hobby defining archetype. Defining the toughness/resilience of a unit in Rogue Planet is a factor of the Unit's Armour (Light, Medium or Heavy), defensive skill trait (DEF from 2 to 7) and various bits of gear including Shields (which can, but not always will, provide a DEF buff) and Powered Armour. Powered Armour provides the wearer with a defensive Rogue Die - basically a 1-in-6 chance of almost certainly negating an attack. 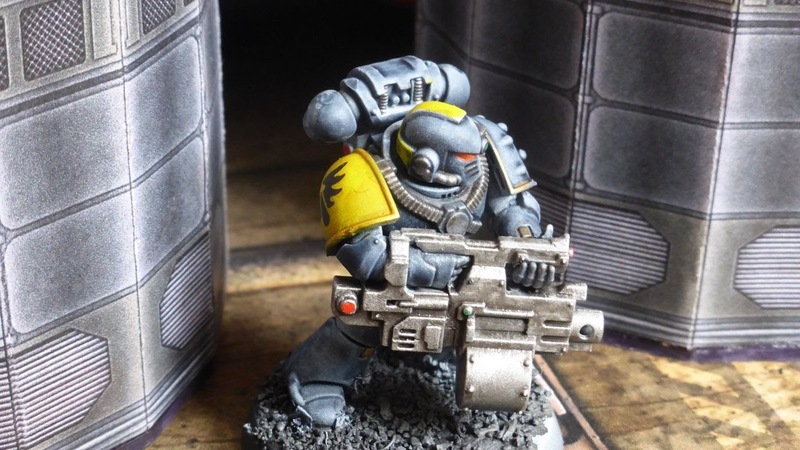 That alone doesn't sound quite right for the Empire's finest, but without it, Space Marines have nothing really that differentiates them from other big, bad, death-dealing units. 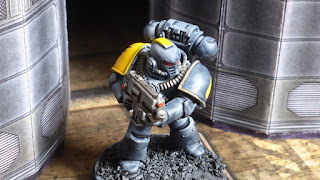 Also, you'll notice I haven't defined any Space Marines as Groups - doing so would negate their Medium Armour advantages/buffs and during my games, I've noticed Grouped Space Marines have been somewhat more fragile for it. Who knows, I might change my mind one day. 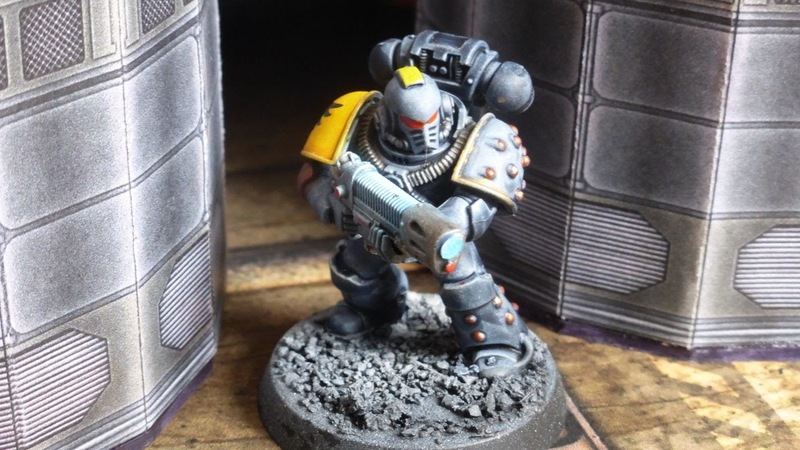 In converting the W40K Space Marines to their Rogue Planet equivalents I've taken the approach of baselining their offensive skills as one skill point higher than typical Imperial Guards i.e. CQ and RAT of 4. Their defensive trait (DEF) is even higher, set at 5. 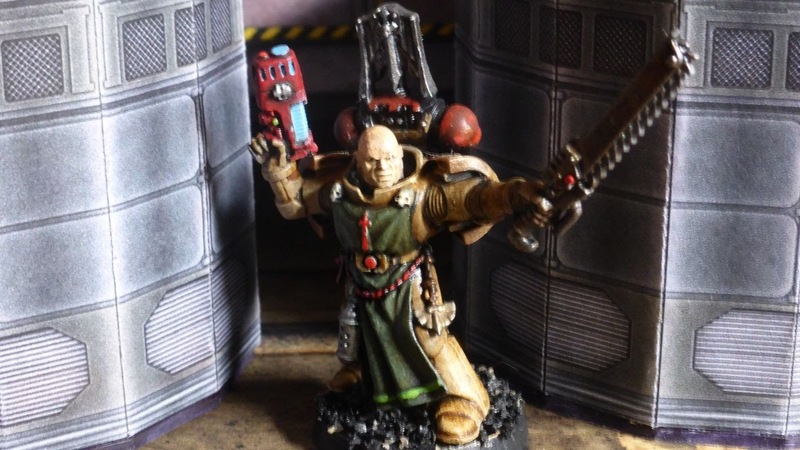 Combining Medium Armour and Powered Armour (hence the baseline 3 Energy Points per Unit) as standards and you've got Units that can absorb a lot of damage and are easily twice as expensive as Guardsmen. 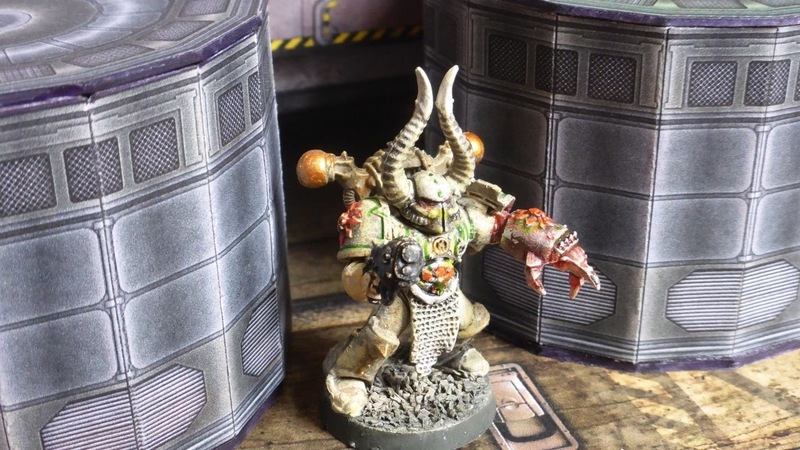 You're not going to be fielding huge collections of Space Marines if you're employing the standard Rogue Planet Credit-point setting - anything more than three Units is going to be a rarity in all but a Level 4+ game - but as we're talking skirmish gaming, that's hardly an issue. PS 25/2/18 Further to a question I just received: these Unit profiles describe 'vanilla' Marines i.e. they're not describing a particular Chapter nor have I differentiated between Chaos and Imperial Marines. Could I? Likely, but for me, it's not that important. 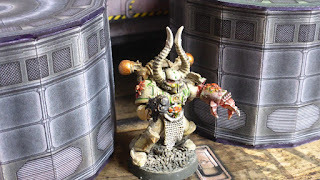 All my Assault Marines and Terminators are exclusively Chaos whilst my Heavy Weapon and Tactical Marines are Imperial. And as far as Chapters go, that's where I'd likely look at different Unit mixes and Leader Pawns. I'm also experimenting with the introduction of 'Doctrines' (as a thing) which combined with additional 'Engagement' mechanics to add some spice to scenarios - together I'm thinking they could be used to further 'flavour' specific forces. Watch this space/blog. To begin with Tactical and Assault Marines. Rather than messing with their traits, it's just gear. Tactical Marines employ Bolt Guns (Carbine with Armour Piercing specialised rounds) and Assault Marines have Chain Swords and Bolt Pistols (Fantasy FX Ranged with Armour Piercing specialised rounds). The ability to downgrade Medium Armour to Light means that similarly armoured adversaries (i.e. 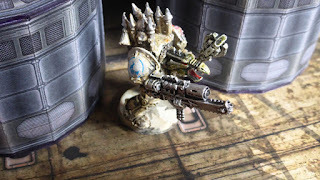 Medium Armour) can be eliminated with a Critical Hit, negating their opportunity to avoid the same using Energy - a useful feature to keep in mind when going head-to-head with the likes of Chaos Marines. It's also worth mentioning that Assault Marines are significantly more expensive than Tactical Marines, but they do benefit from an extra Energy Point due to the powered weapon rule - that translates to extra survivability. 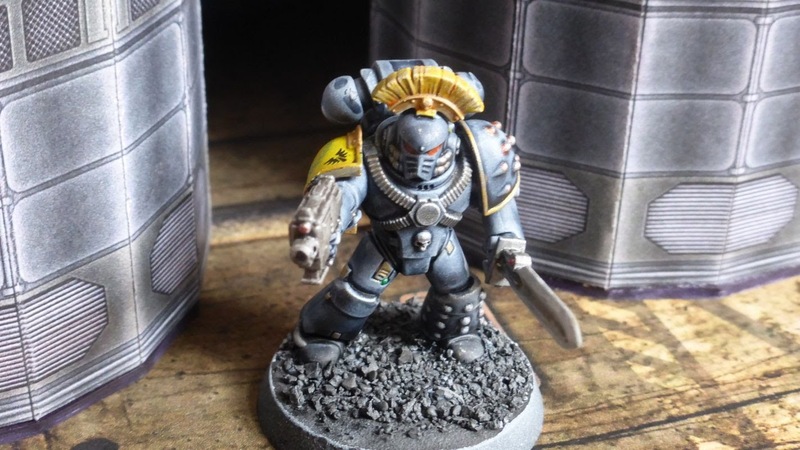 Space Marine 'Champions' are a common feature in the W40K universe- the elite of the elite - so it's only right I've included an Assault Champion. Armed with a Power Fist and Plasma Pistol (hence the lift in its RAT Skill) it should make for a lot of fun, especially given it can perform a Throw Action with an open fist-related buff - particularly useful when it comes to clearing a path to an objective. I've detailed both a Plasma Marine and Heavy Bolter Marine. Trying to remain true to the Rogue Planet rules, I've armed them with a Heavy Launcher and Machine Gun respectively as well as raising their RAT by an additional point - that lifts their ability to both hit and deal damage relative to (for example) an unaugmented heavy weapon Guardsman. Presently I've got two Space Marine heroes in my collection each with a different loadout: a Sergeant with Bolt Pistol (who has had his DEF buffed relative to a regular Assault Marine) and Powersword (which Blade + Powered, slightly less effective than a Chainsword) and a fearsome Lieutenant (similarly buffed DEF) with a Chainsword and Plasma Pistol (I've designated as Armour Piercing and also buffed his RAT up to 6). It's worth noting that both Power Weapons boost the unit's CQ and the Force's Energy Pool. Terminators are another matter altogether. They're often likened to walking tanks so I've increased their DEF by a point and lifted their Armour from Medium to Heavy, which also adds to the Energy Pool. 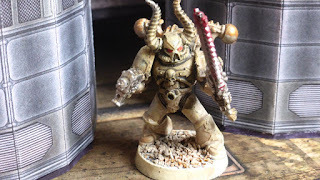 I've kitted one out with a classic Terminator with Flamer and Powerfist combo - watch out genestealers! 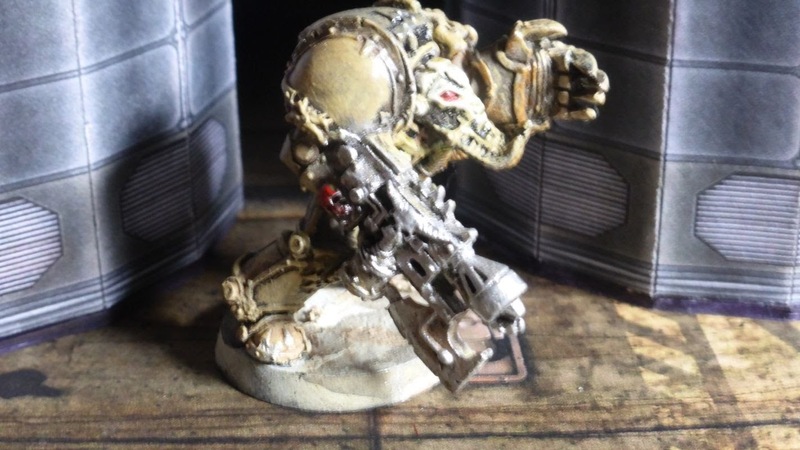 The other I've designated as a Terminator Champion with a Gravity Hammer - a Rogue Planet weapon that throws targets when struck. Gravity Weapons are classified as "Signature Weapons" therefore to field the Terminator Champion, it need be designated as a Hero or Leader. What about all the other Space Marine variants? Well I've got a few awaiting their turn on my workbench e.g, some other special weapons loadouts. Like any hobbyist, my intention to do outweighs my work in progress by several orders of magnitude; but once they're done I'll prepare another deck of Unit Cards. Two things that I haven't acquired but would like to are Dreadnoughts and some jump-pack equipped Marines - if you've got some spares lying about, they'll be gratefully received, regardless of their condition AND I'll expedite their painting and unit card publication. Awesome, man! Thank you for your work and break down of how the systems work! Keep it up! Also, would this game be compatible with table top simulator? No problems bro. 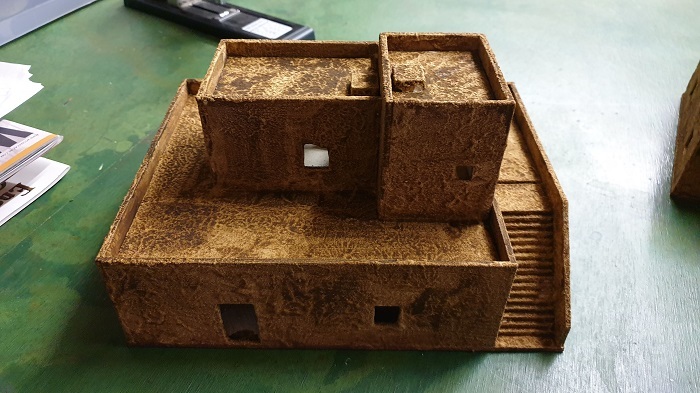 "Would this game be compatible with table top simulator?" I don't see why not. I've no experience with TTS (however I've always wondered what it would be like to use), but if you think it would be fun and worth the effort, count me in to make it happen!